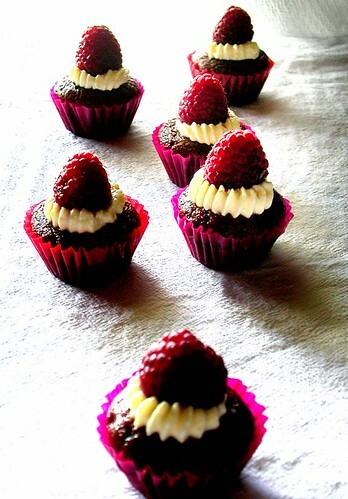 one (or two or three) for the weekend: almost flourless valrhona chocolate mini-cupcakes with a squidge of double cream and fresh raspberry. my take on the fabulous chockylit's take on the inimitable clotilde's chocolate cake. follow the links to the recipe, but bake for 10 minutes only, then keep in the oven for 10 minutes with the door closed before removing them to cool. so very simple, and i promise you, one of the best chocolate cupcakes (mini or otherwise) you'll ever have. back in the seventies, mrs. kong, a nice lady from hawaii, served a salad to me that was unlike anything i'd ever seen--shredded chicken, styrofoamy spiderwebby fried rice noodles, funky strips of luminescent red pickled ginger, sesame seeds, and the absolute heighth of exoticism to guamish child santos--iceberg lettuce cut with a knife into neat little squares. what tha heck is this? "why, chinese chicken salad!" she said, like i being of some chinese origins should know. sure. okay. it was squeaky. i liked it. of course, it disappeared when she and her family moved back to kauai, and i didn't think about it again until i went to university in the eighties. i lived in los angeles near a mall that had this chinese fast food place called panda express, which is now a mungo-normous chain that has the dubious distinction of having drive-through windows (how do you get three choices when you have no idea what's in the steam tables? does the hot and sour soup fit in your car's drink holder? ), but back then was just this funny turo-turo-style chinese joint, with a steam table holding hot foods of various chinese-american origins, and in the back they had a giant tub of chinese chicken salad that wasn't far off from mrs.kong's variety. the only difference was that it also had strips of fried won ton noodles, and the dressing was little more than diluted white vinegar, unlike mrs.kong's soy sauce-vinegar-sesame oil mix. manoman, i loved that stuff. squeaky, pale, and bland, but with occasional bits of chicken or pickled ginger all doused in vinegar water (say what you want, but that iceberg lettuce never got bogged down in oily limpness). around the same time, chinese food got sort of hip in la, and a couple of mid-priced, trendy restaurants opened up, chin chin, and mandarette. the two restaurants could not be any more different from each other--chin chin was (is) young z-list actors' paradise on the sunset strip, with overly bright lighting, no style, and overly salty, overly sauced american-chinese food cooked by really nice mexican cooks. mandarette was (is) youngish a/b-list actors' family chinese restaurant on an busy part of beverly boulevard, poorly lit, eclectically decorated, with very, very good food cooked by surly chinese men. the one thing that they had in common (besides the fact that i was a regular at both) was that their chinese chicken salads were almost exactly the same. which was pretty much the same as the panda express version, only with more chicken. fast forward to now: between uni and now, i think i've had chinese chicken salad only a handful of times; it no longer seems fashionable to serve it in restaurants (iceberg lettuce! the horror! ), and all that slicing, dicing, and frying at home seems like such a big deal. 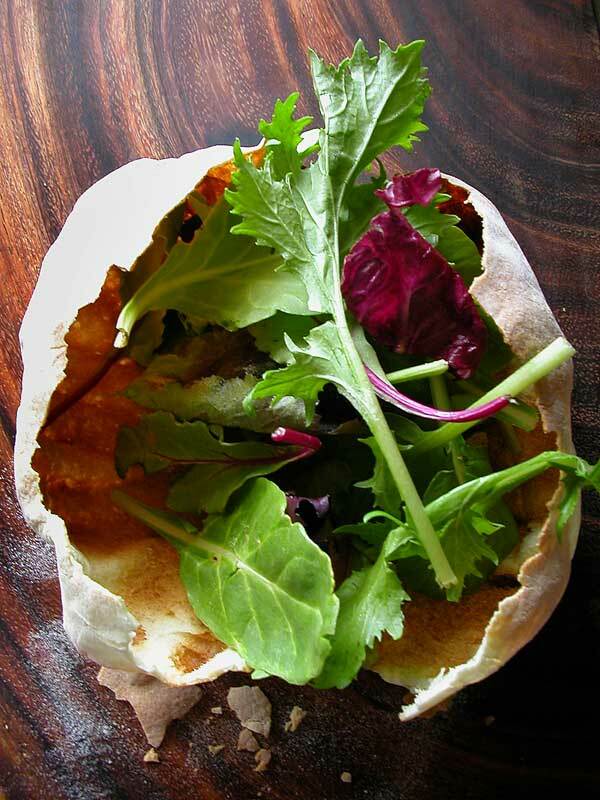 however, now that we are getting some interesting foliage to eat on a regular basis, and if i skip the frying part, it doesn't seem to be such a big deal anymore. 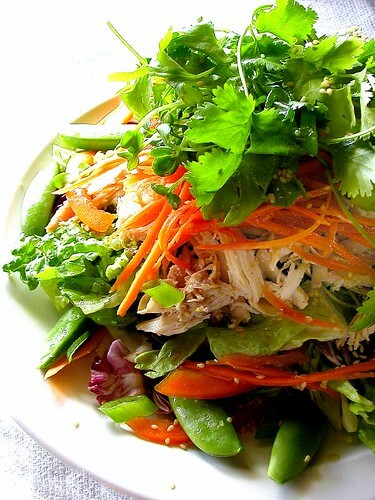 this particular salad in the photo above is made from one of those mixed bagged salads (i believe it was called big ole bag o' organic greens™), sugar snap peas, shredded carrots, sliced orange sweet peppers, radish sprouts, chopped spring onions, cilantro, and shredded breast of supermarket rotisserie chicken. veddy simple, yazzz. even if you can't/won't get all the mod cons, it's still simple enough to assemble whatever you want for your salad--try adding watercress, cabbage, radishes, or yes, yes, iceberg lettuce . if you add toasted sesame seeds, sliced almonds or crushed peanuts, you won't miss all that fried noodle-y stuff all that much (or maybe you can get reid to send you a bag of "one ton" strips), and you save yourself a load of aggravation and added fat. the dressing is simple enough, and can be played with at whim: the basics are ginger, vinegar, toasted sesame oil, and vegetable oil. my version also includes a bit of fresh cilantro and ground coriander. just 'cause. mix everything but the oils together in a bowl. add the oils in a steady stream, whisking vigorously until incorporated. dress salad just before serving. yes, i know, but i said. 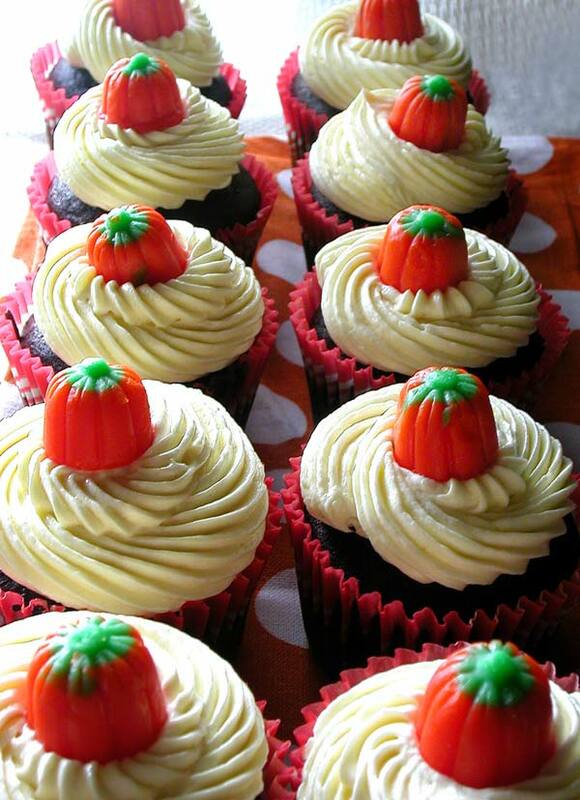 devil's food cupcakes with a standard buttercream and pumpidypumpidy candy pumpkins. out of the pink and into the blue. ah, where is bramble when i need her? probably in the lab. okay, kiddies, a half-remembrance from high school science: litmus is pink in acidic solution and blue in basic solution. 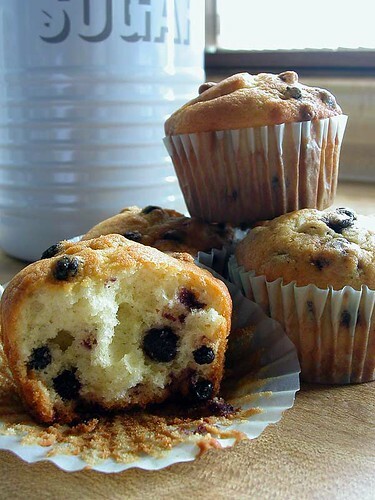 i needed a recipe to use up some blueberries, i found a basic solution in elise's blueberry muffins. nothing too fancy, nothing too difficult, something quite delicious. thanks, elise! 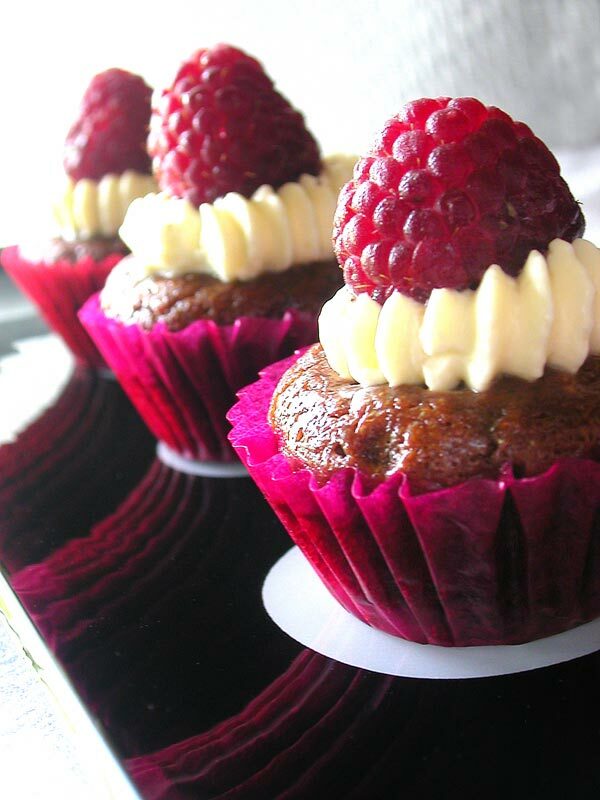 chapter 10.25: in which santos finds she is baking a lot of cupcakes these days. "Pooh," he said, "Christopher Robin is giving a party." 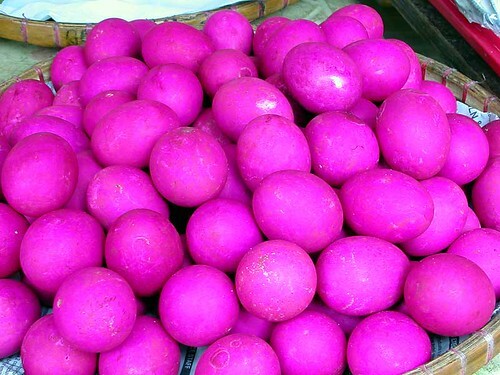 "Will there be those little cake things with pink sugar icing?" Owl felt that it was rather beneath him to talk about little cake things with pink sugar icing, so he told Pooh exactly what Christopher Robin had said, and flew off to Eeyore. 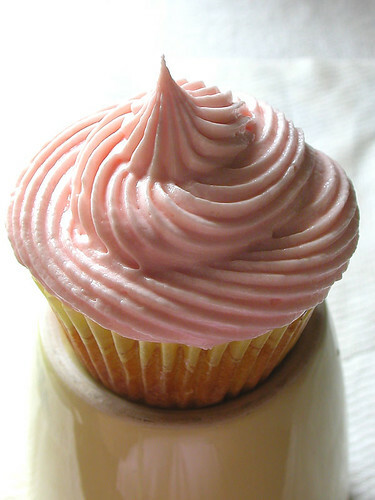 simply a simple vanilla cupcake (recipe from simply bill, natch) with pink buttercream. go visit jessica, because she quotes similarly, yet not so owlishly. 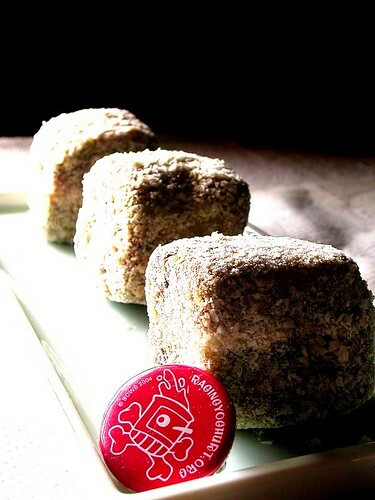 bowb brought forth the challenge, and this is my response: a matcha green tea sponge cake lamington, with a red bean and double cream filling, lightly coated with a smooth red bean paste and dessicated coconut. 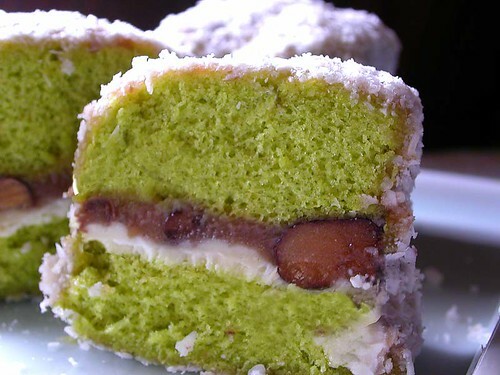 i simply added a few teaspoonfuls of matcha powder to a standard sponge cake recipe baked in a square pan, cooled it, cut it in half and spread double cream on one side, and a chunky red bean paste on the other, then sandwiched the halves together and froze the cake for easier handling. i cut the cake into cubes, spread a thin layer of smooth red bean paste on all sides, then rolled it in dessicated coconut. deelish. i woulda never have thunk it, so i'm glad she did. hope it meets your standards, cakelet queen! 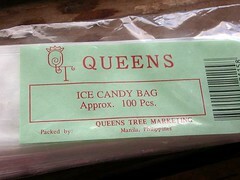 one of the things i usually bring back from the philippines is a small packet of narrow plastic bags used for making ice candy. 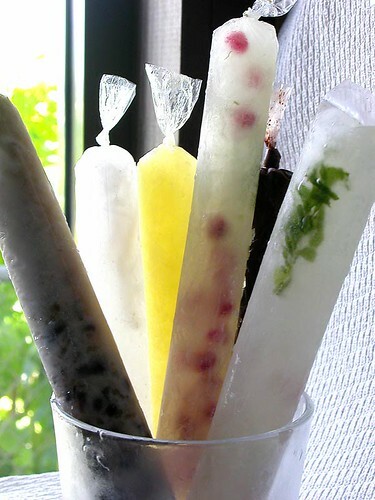 i am more of a popsicle than ice cream person, and whenever i have a little juice or some overripe fruit, i like to have the bags on hand so i chop or purée the fruit, add the juice, then throw them in the freezer for a future, frosty treat. 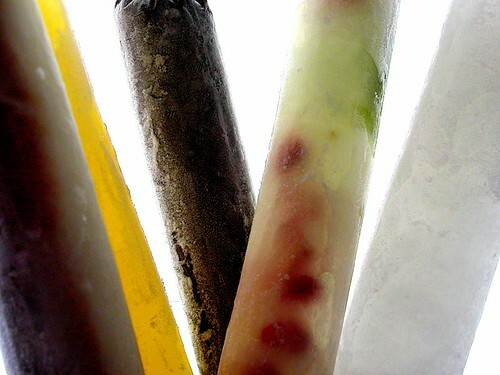 ice candy is basically a popsicle made usually from a combination of fruit and water, and the one i recall seeing the most in the philippines is one made from sweetened young coconut water (buko juice) and shreds of the young coconut meat. however, you can make them from whatever your creativity or your pantry will allow. from the left: sweetened red bean (anko) with crushed ripe strawberries and milk, pineapple juice with lychee fruit, traditional sicilian chocolate gelato (an alice medrich recipe--it is the most luxurious pudding pop you'll ever have), limeade with pomegranate seeds and mint, and young coconut juice with bits of coconut and lime zest. just pour the ingredients into each bag (a funnel would be easiest, but a pitcher works fine), tie off the top, then throw into the freezer. if you have one of those heat sealing vacuum machines, you can make similarly shaped bags, or use a popsicle mold or little plastic or paper cups. 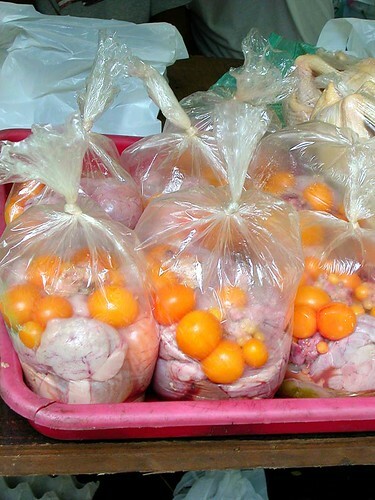 the nice thing about these bags, however, is that the plastic offers a little built in protection from sticky fingers, and they can be toted around for a picnic or backyard barbecue with little fuss. hey, any chance this qualifies for lasang pinoy 3? a new cookbook (or two. or three). i buy a lot of my UK-published books in the philippines because it's more economical for me than to order them online. 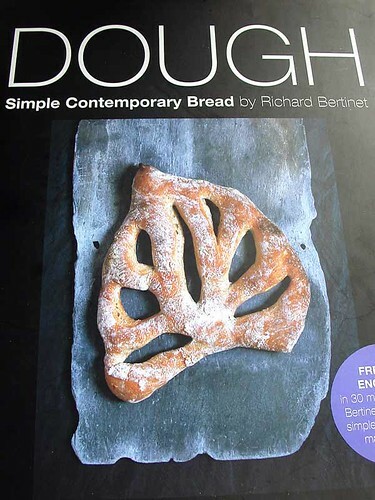 i bought three cookbooks this time around: gorgeous cakes by annie bell, roast chicken and other stories by simon hopkinson with lindsey bareham, and the book that is currently holding my fascination, dough, by richard bertinet. i used to bake bread on a regular basis, and became fairly adept at it. 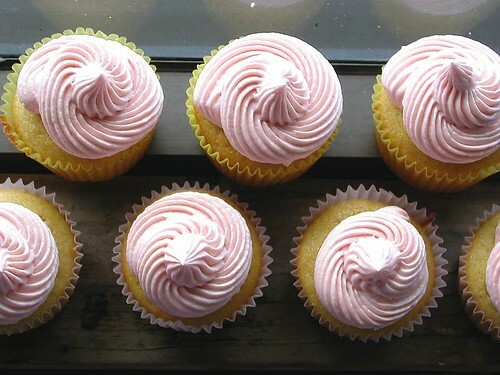 i had experimented for months, with different kneading and proving techniques, various equipment and ingredients before coming to the conclusion that the simplest possible recipes and techniques were often the best. what i like about bertinet's book is that there are five very simple doughs from which his recipes evolve, and he has a simple, yet effective method for working the dough that uses your fingertips, not the heel of your palms, that takes a fraction of the normal kneading time and seemingly incorporates more air for a lighter, bouncier product. i haven't baked bread regularly for several years, so i have lost the knack for it, and felt it was best to start at the very beginning. 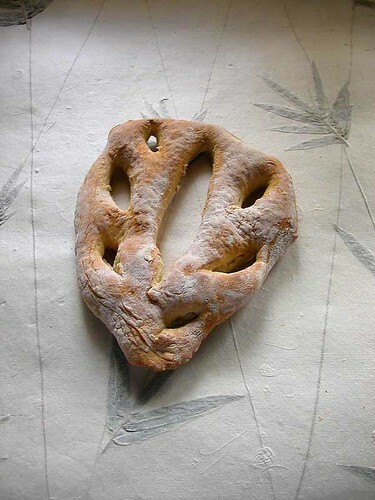 i did as the book suggested and tried the first recipe, for fougasse, which turned out well taste and texture-wise but only looked okay (the problem was i lost track of time and have no idea how long it rested). i know i can do much, much better. i was, however, quite impatient to try making a puff ball, which is one of the recipes that sold me on the book. 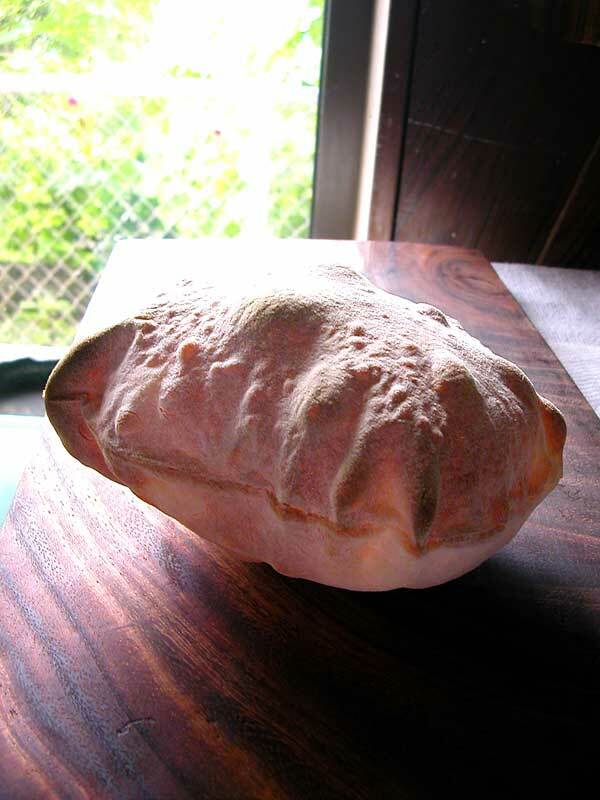 the puff ball uses the same dough as the fougasse, but it is rolled out as thin as possible, and then baked on the highest heat, where it bloats and crisps into a hollow zeppelin of the thinnest crust and not much else. bertinet includes a cute little trick of how to create a small hole on the bottom of one, in which salad greens can be stuffed; served right side up on a plate, with instructions to break through the center at will, it becomes a little entertainment along with a starter salad with built-in bowl and crouton. i'm still stuck in the first chapter, where there doesn't seem to be a recipe i don't want to try; i'm looking forward to the sweet dough chapter where i espied doughnuts and a chocolate bun that screams to be made. 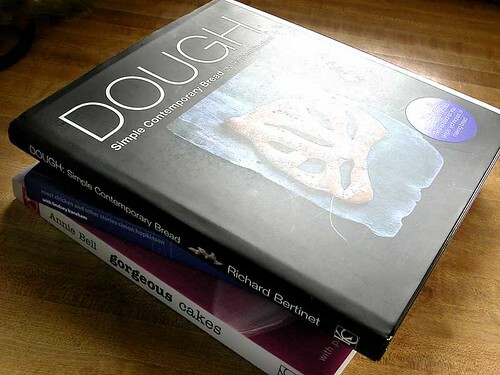 my particular copy of "dough" also includes a short, but very helpful dvd that illustrates bertinet's dough technique, so perhaps i should do a second viewing; hopefully the next fougasse will be up to snuff. this post is for reid, too bad he can't actually have the drink! the starbucks coffee jelly frappuccino®: whatever that milky coffee frap stuff is and a healthy serving of coffee-flavoured gelatin cubes. 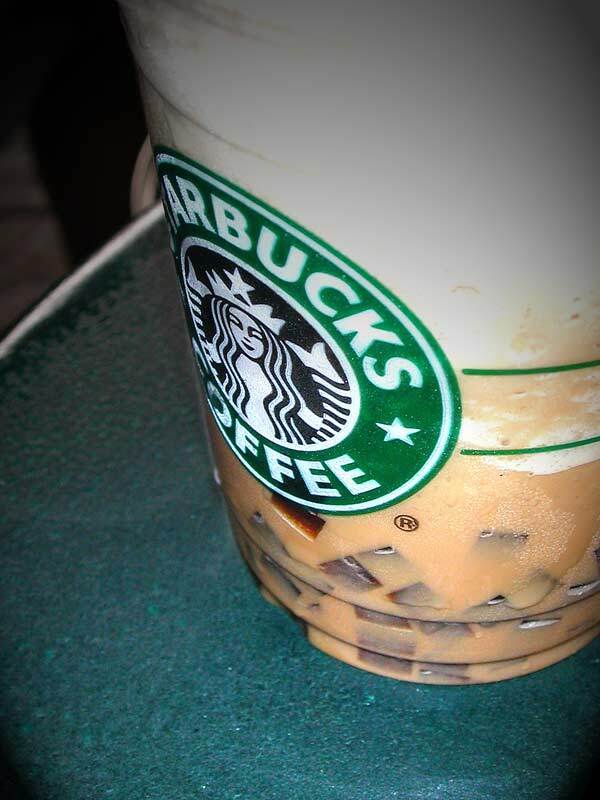 unlike the coffee jelly found in boba-tea outlets, which are just unflavoured brown tinted gelatin cubes in a coffee syrup, the starbucks brand is purported to be made from the brewed house blend. tiny and tender, they make a refreshing addition to the ice blended drink. 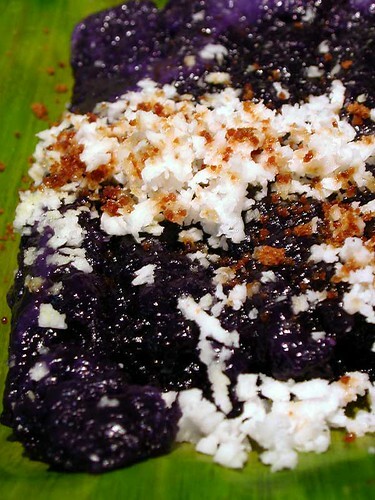 it used to be a seasonal specialty, but it has since moved to the permanent menu (in the philippines, anyway). the care and feeding of a cutting board. 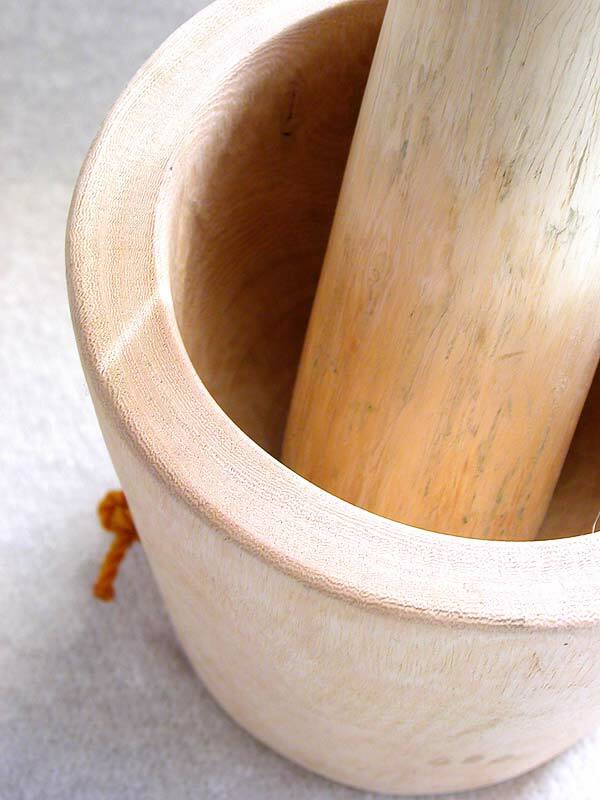 i bought a couple of cutting boards when i went to the salcedo market: a round chunk from the trunk of a tamarind tree, and a rectangular one hewn from an acacia tree; i also bought a very nice mortar and pestle made from tamarind wood. all three pieces were had for the very nice price of about US$12. unfortunately, when i got back to guam, i noticed that there was some cracking in the tamarind wood pieces--i think that the change in altitude/cabin pressure during the flight had something to do it (either drying out the wood, or something else that would cause it to contract and expand). 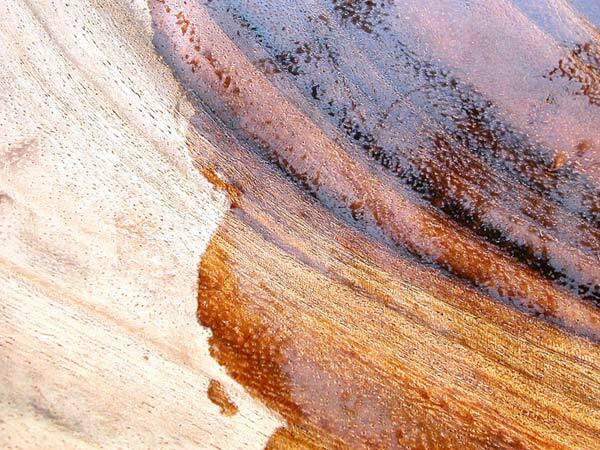 the acacia board did not suffer, but perhaps all the boards could have benefited from a thorough oiling/seasoning before making the flight. 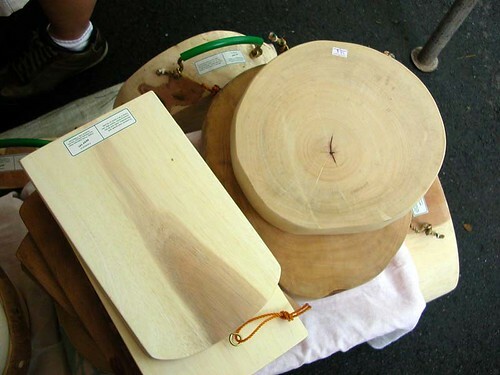 generally, you should oil your untreated wood cutting boards to seal the grain from bacteria, prevent absorption and staining, but it also keeps the wood moisturized and prevents splitting and cracking. 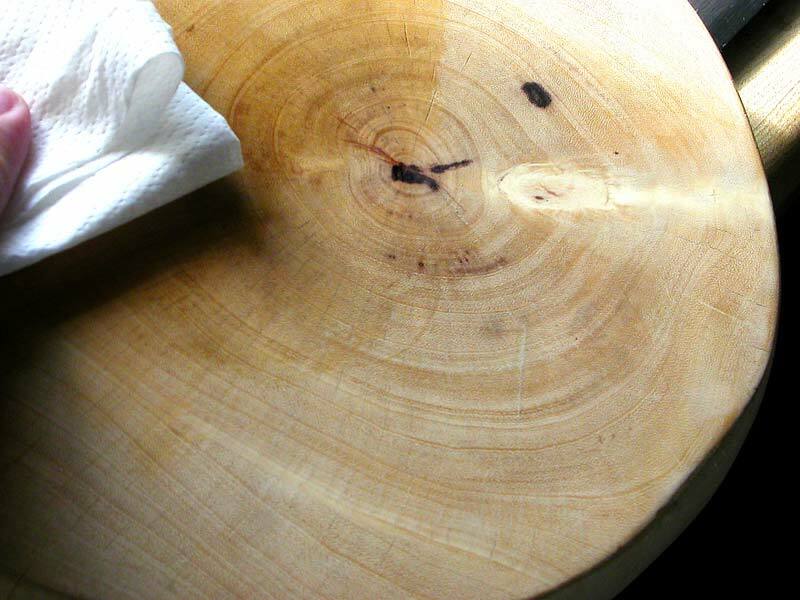 you should oil a board thoroughly before you begin using it, and regularly wipe it down to nourish it. use a neutral food grade oil that will not go rancid. i used mineral oil because it's relatively inexpensive and readily available. all you really need is the oil, a lint-free cloth, and some newspaper. there are two ways that i know of for oiling a board. the first way is to warm the oil slightly and apply it with a cloth, in the direction of the grain. allow the oil to soak through for several hours, then wipe down any excess oil. apply several more coats (four or five), leaving it to sit between each application. the other way to set the board on several layers of newspaper, pour the oil liberally onto the wood surface, and leave it to soak overnight. wipe down any excess oil the next morning. after this initial process, apply some oil to the board on a regular basis--monthly if it's used daily, and at your discretion for occasional use. another advantage? 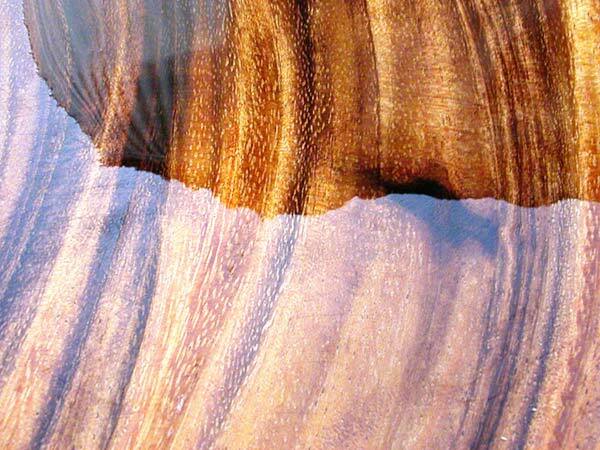 it brings out the grain of the wood beautifully. 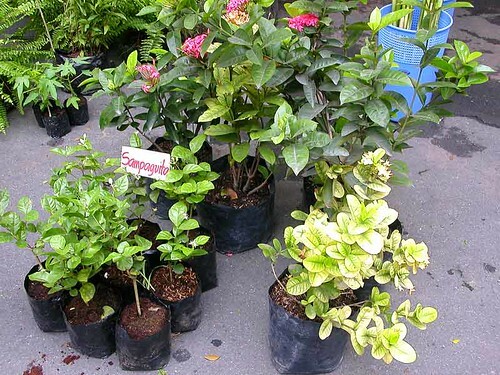 manila: salcedo market, pt.5: plantlife. after all, what's a market without flowers? 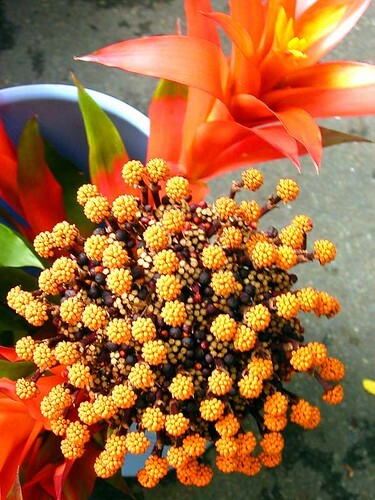 birds of paradise, and um, ginger flowers? anybody? sampaguita, a type of extremely fragrant jasmine; the national flower of the philippines. 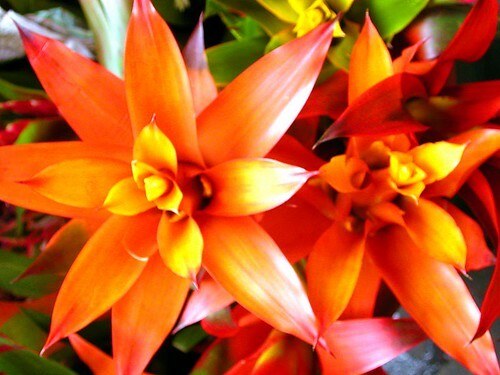 bromeliads--okay, not a flower, but still pretty. another one i need help with--any ideas? i love it, though, so unusual. 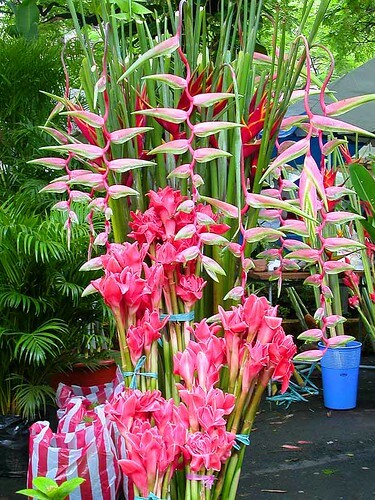 milflores, or "a thousand flowers". 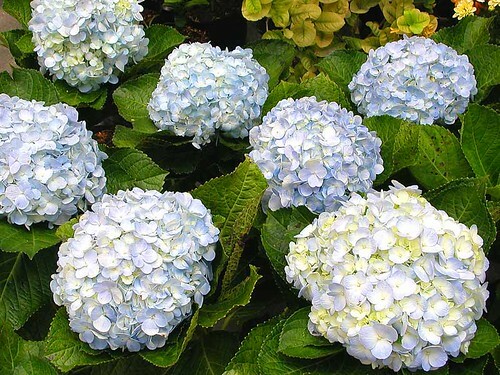 somehow, hydrangea doesn't sound as romantic. have a good weekend, everybody! manila: salcedo market, pt. 4:...and the cooked. 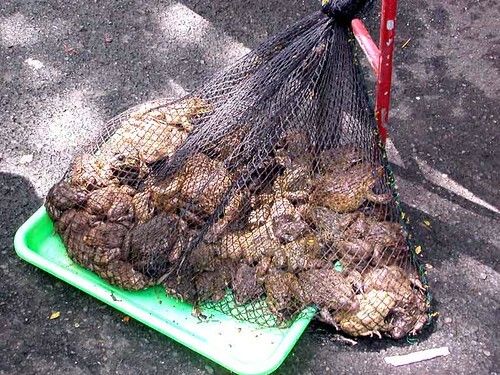 of course, not everything is still hopping or twitching at the market. 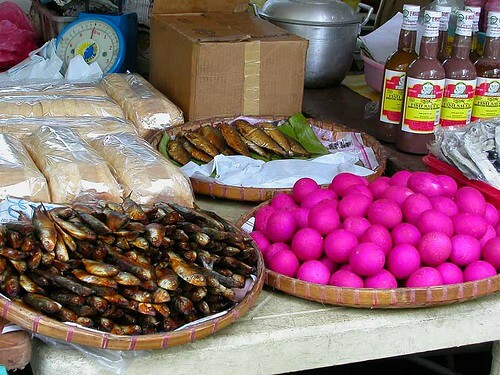 many local specialties can be found, including a large variety of preserved and pickled items, from fruit and vegetables, to meat, fish and eggs, including the salted eggs pictured above (that photo is for oslo foodie, who will appreciate a fine display like that). 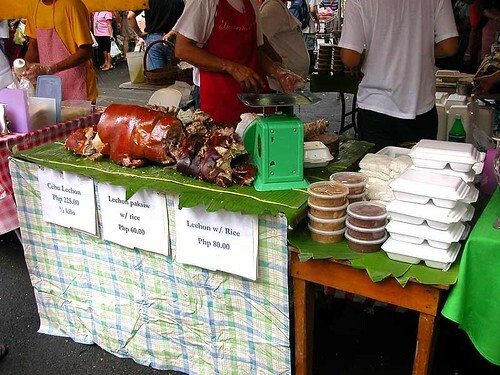 there is also a vendor who sells the only handmade fresh mozzarella i've seen in manila, along with several who have a nice supply of carabao (water buffalo) milk, and artisinal quesong puti, the local white semi-soft cheese made from carabao milk and wrapped in banana leaves. 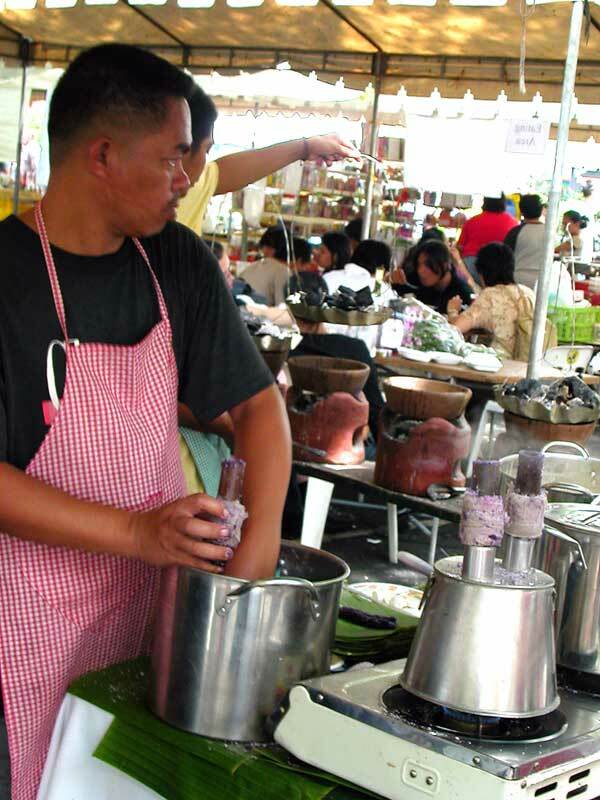 soy items like tofu and taho are in abundance as well. 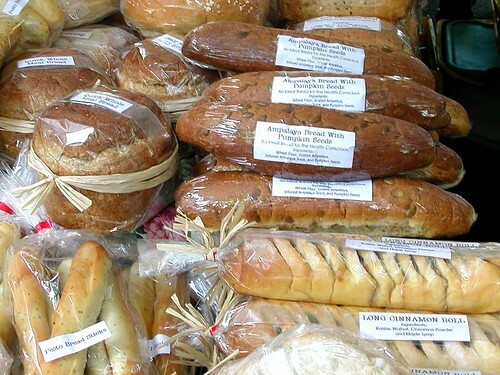 however, the biggest draw to the market is the cooked and prepared foods, whether it be specific items or set meals. there are plenty of tables to enjoy your meals there, if you can't wait to take them home. 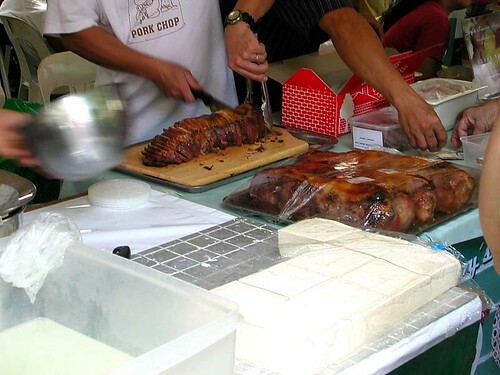 although you can get everything from australian beef steaks to vietnamese spring rolls, the most prevalent items seem to be all manners of pork, and barbecued fish. next to the tofu, you'll see a man slicing up a log of swiss-style baked ham. i'm not sure what makes it swiss-style, can anyone enlighten me? it seems to be an omnipresent item these days. 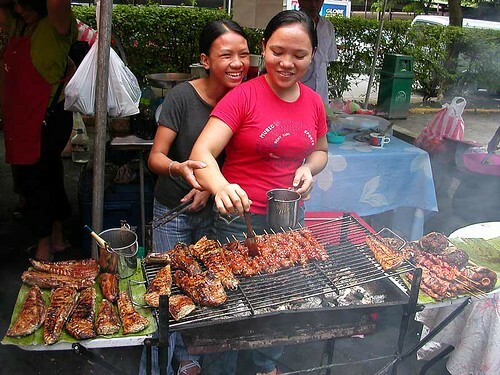 lechon, or roasted pig, is always popular, and can be had by the kilo or in rice plates. 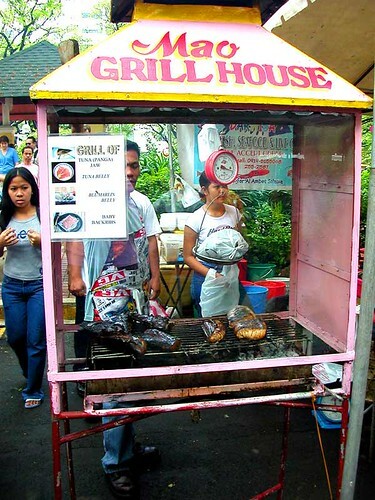 there are also takeaway containers of lechon paksiw, which is chunks of tender pork meat stewed in a tangy, liver-enriched sauce. 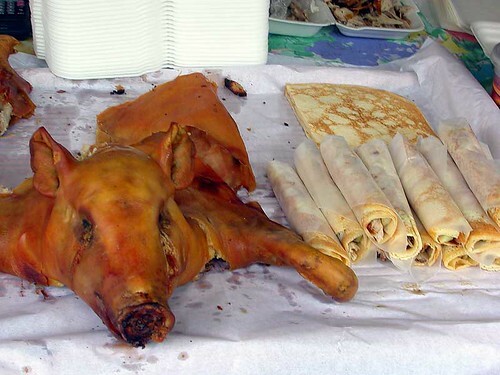 the current trend in parties is to serve roast suckling pig as prichon (a contraction of prito + lechon for "fried pork"), where fried roasted pork meat and crackling is rolled in an eggy crepe with spring onions and hoisin sauce, not unlike how peking duck is served. hito, or catfish on skewers. grilled tuna jaw and blue marlin belly. i also rather happily found a man making and selling puto bumbong, a sweet rice cake that is normally found only during the holiday season. 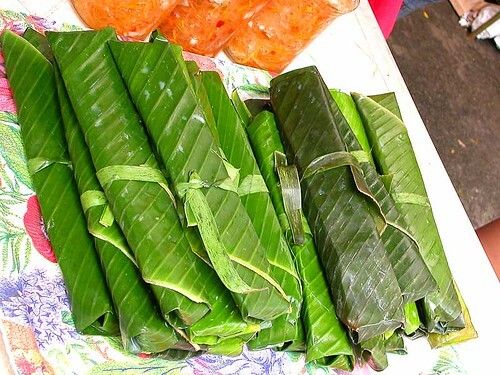 violet-hued glutinous rice (pirurutong) is soaked and ground, then dried and stuffed into tubes of bamboo that are set upright onto a steamer, and cooked until soft and fluffy. 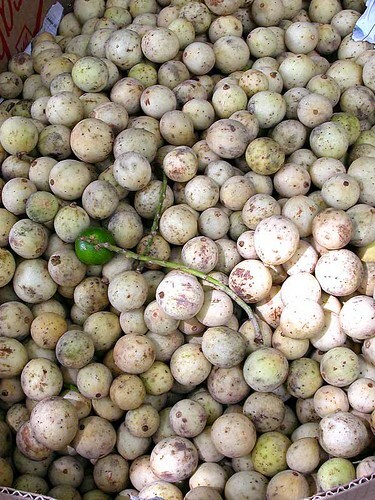 it is then served with freshly grated coconut and muscovado sugar. although the holiday season is usually heralded in the philippines by the horrific strains of christmas carols incessantly played on the radio from the first of september, i normally try to ignore it. however, with delicious holiday treat already in the marketplace, i'm starting to feel a bit festive. toto, i've a feeling we're not in kansas anymore. 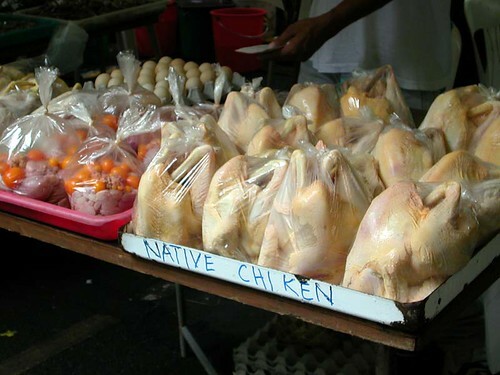 market meats: native chiken [sic], which on guam, usually means roadkill, but for you fine folks, i shall interpret as "free range". see those orangey blobby things? those are, for lack of a better phrase, "pre-laid eggs". all you lacto-ovo vegetarians, don't dwell on this too much. 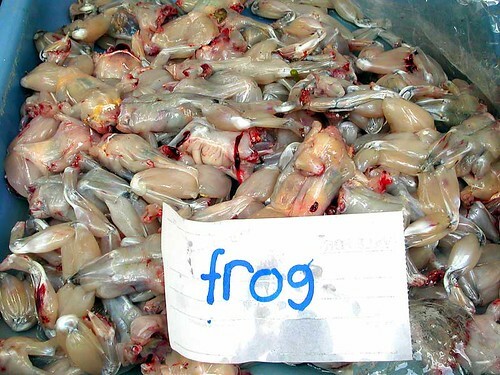 speaking of which, my lovely auntie f. has written a great article ostensibly about a capampangan folk song, but in reality is about frog baiting and days gone by. do check it out. manila: salcedo market, pt. 2: carbs! 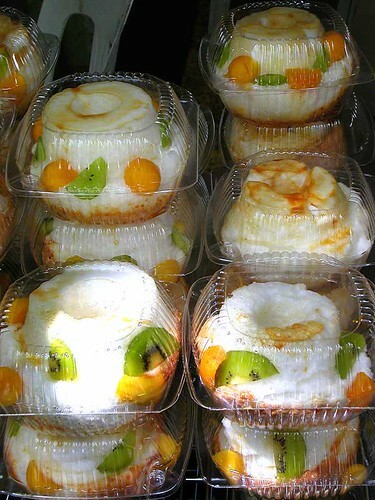 more from the market: canonigo, aka floating island--a feather light meringue cake with custard sauce and fruit. 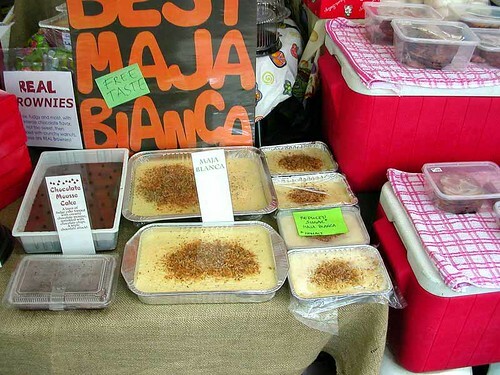 maja blanca, a traditional coconutty, milky pudding. 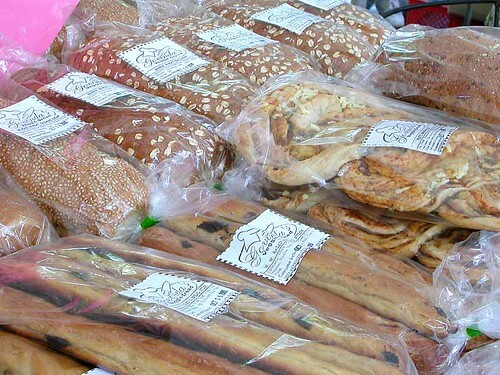 whole grain breads and pastries still aren't commonly found throughout filipino supermarkets, but are in abundance here. there were some very creative concoctions including bittermelon pumpkin wheat baguettes, macadamia pesto twists, spinach batards, and cappuccino rye loaves. 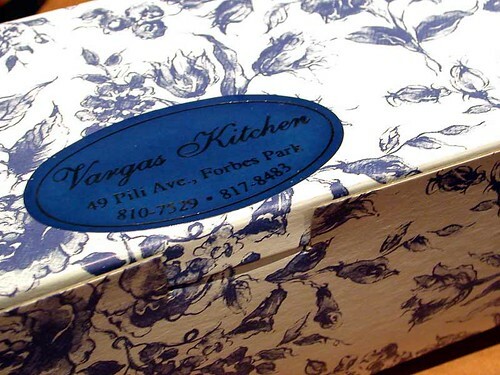 i also found the much discussed vargas butter cake. 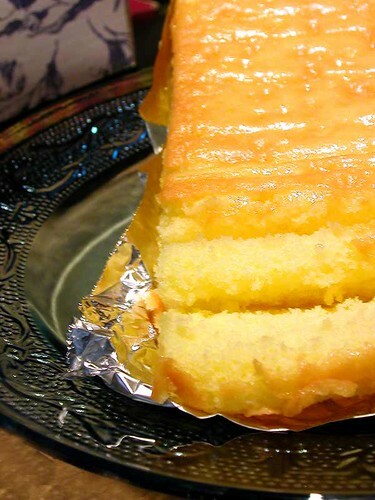 surprisingly light, it's basically a moist, spongey cake that tastes like it's saturated in high fat butter. gaaaaaaaah. 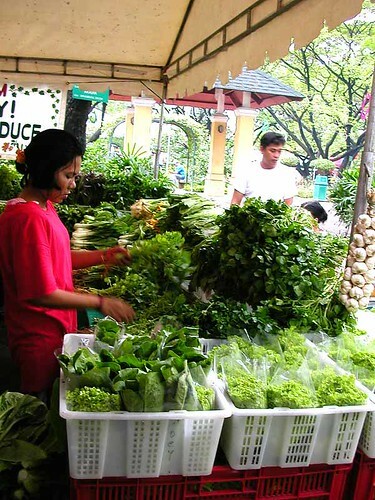 manila: salcedo market, pt.1: produce. i'm back! with an actual haircut (i keep thinking the name of the salon was sinking titanico, but i am most likely wrong), and a full belly. 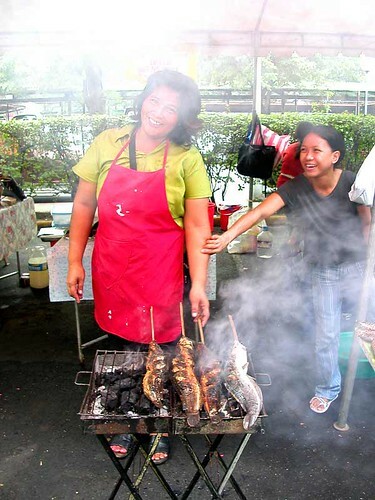 i took a tip from market manila and visited the saturday open air market in nearby salcedo village, which turned out to be the highlight of the all-too-short jaunt, so i'll be posting photos from the market for the next few days. 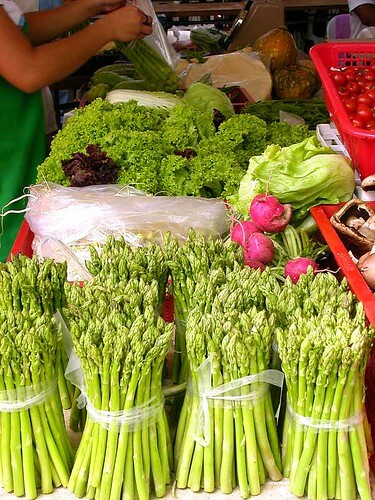 local asparagus, radishes and lettuces. 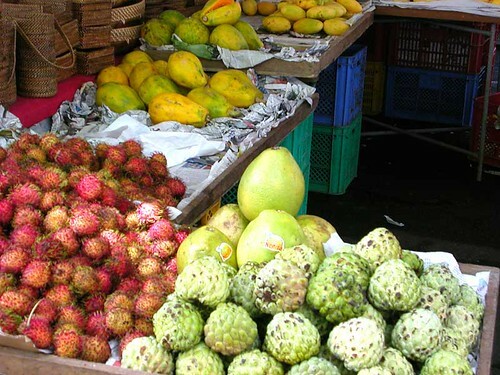 rambutan, suha, atis, papaya, and mangoes (although i think they are out of season). 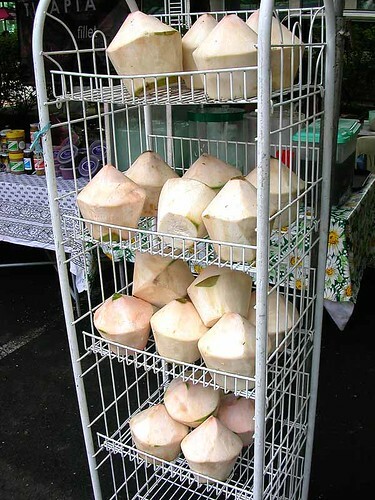 young coconuts, husked and ready for drinking (and of course, eating).